Yoga can very easily become part of a conscious parenting roadmap to complete wellness for parent and child. Intentional Conscious Parenting shares ideas on raising children in an intentional way with a focus on inner connectedness, trusting our intuition, connecting with our angels, mother earth, celebrating each child's uniqueness and bringing out their inner creativity. Discover what the ideal environment, care and foods are, to allow children to develop to their healthiest, strongest potential, also long term, then we need to take into consideration the whole picture of what a child is, and what their real needs are. From this perspective, it behooves us to take a conscious approach to parenting, observe our children, observe ourselves and ask ourselves questions. 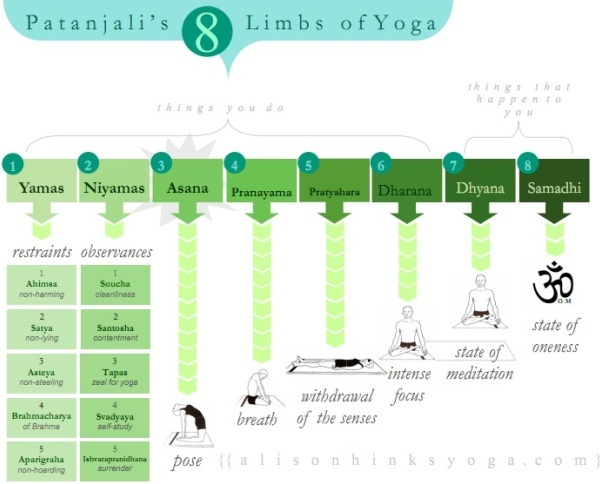 The eight limbs, or steps to yoga, are as follows and the second one provides ideas to incorporate into conscious parenting for the awakened parents and grandparents. Niyama, the personal observances will be explored. Shaucha implies both external as well as internal purity. In the words of sage Manu, water purifies the body; truthfulness the mind; true knowledge the intellect and the soul is purified by knowledge and austerity. It advocates the practices of intellectual purity, purity of speech and of the body. The second niyama is that of contentment, which is described as not desiring more than what one has earned by his honest labor. This state of mind is about maintaining equanimity through all that life offers. Santosha involves the practice of gratitude and joyfulness—maintaining calm at all costs. This state of mind does not depend on any external causes. Austerity, the third niyama, is described in Yoga philosophy as power to stand thirst and hunger, cold and heat, discomforts of place and postures, silent meditation and ritual fasts. It also maintains that the perfect man is he who practices both mental as well as physical austerity. Tapas is often given to mean austerity, the austerity is however the means of creating the heat. Tapas in this sense is the heat required for purification. At each level of our being purification is usually uncomfortable, getting increasingly so at subtler levels. It takes therefore a real conviction and courage to hold oneself in this fire. Tapas then also implies the heat of desire for truth, for self realization, for liberation required to keep stepping into the fire. don’t use this energy in any way that might harm others. According to the tradition, Vyas, self-education or swadhyaya consists of scriptural studies. The scripture being, the Vedas and Upanishads together with the recitation of the Gayatri Mantra and the Om mantra. The more we examine and study ourselves, the more we learn and reflect. When we study ancient text, whether it is the Yoga Sutras, the Bible, or any other thought provoking books that cause us to reflect, we are able to become closer that that which we really are, God consciousness. As we practice Sauca, Santosa and Tapas, we are free of unhealthy distractions, mind clutter, bodily toxins, and we begin to feel better, to feel a little zest for life. Since the Niyamas build on one another, it only makes sense that Swadyaya, self-study, is the next step in the continual practice of self-discovery. As already expressed swadyaha is seen and required in each of the eight limbs. To do any action, be it a spiritual practice or something mundane without svadyaha is to be asleep in the dream. Swadyaha is the light that illumines our life wherever we shine it. Practicing and developing self-awareness is what transforms the eight limbs from rigid rules into principles for living that can be applied with appropriateness to the moment. Swadyaha is also the keyhole in the door that forms the veil of separation. It is also part of the key itself made up of the alive and vibrant totality that the eight limbs form in it’s light. In christianity isvara pranidhana is expressed as "thy will be done’. When the egoic mind has been tempered through living and deepening the yamas and niyamas and other limbs, space opens in us to feel and perceive the movement within life that is beyond our personal thoughts and desires. We begin to connect to the presence of the Divine and feel it’s movement around us and through us. Isvara Pranidhana, is a journey in itself, a broad threshold of subtler and subtler letting go. Yet it to is present and developed in each of the eight limbs. By now it is becoming apparent that in a holistic, even holographic way, each of the limbs and their aspects is in some way present within all the others. Rather than a series of stepping stones there are like a tapestry woven together, each requiring and supporting the others. Conscious parenting requires us to look at all our universal options and incorporate the ones that touch our heart and open our minds. Yoga provides a great foundation for the beginning : middle : end of our life cycles, from birth to death.